TV Guide is known for helping you find something good to watch on television and, in a bid to stave off irrelevancy, has now changed with the times to offer a guide to TV shows online. The Online Video Guide lists where on the web you can find clips and full episodes of your favorite TV shows. Unlike YouTube, the focus here is on professional content. You can search for shows (show, celebrity name, etc. ), browse videos by category (Britney Spears, Viral Clips, etc. ), and sort by popularity. 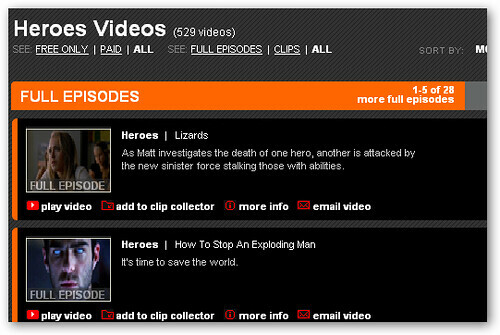 So say you're looking for episodes of "Heroes" to watch online. TV Guide lists the full episodes that you can watch on NBC.com along with short clips, and you can either go directly to watch them, save them in your Clip Collector, or email the link to your friends.